Choose Edit | Preferences to open the Preferences dialog box and change a variety of settings that determine how Sketchpad works. You can also choose Preferences from the Context menu. 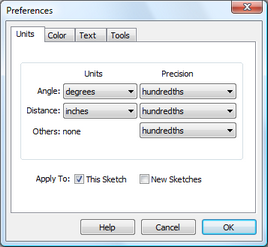 The Preferences dialog box includes four panels: Units, Color, Text, and Tools. An Advanced Preferences command allows you to control additional aspects of Sketchpad’s operation that need to be changed rarely, if ever.. When you make changes in Sketchpad’s Preferences, use the Apply to checkboxes at the bottom of the dialog box to decide whether your changes will apply to the current sketch only, to new sketches only, or to both the current sketch and new sketches. Choose This Sketch to have your changes affect newly constructed objects in the current sketch. Click New Sketches to have your changes affect all new sketches (including new blank pages you add to the current document). If you want some changes to apply only to the current sketch and some to apply only to new sketches, you’ll need to open the Preferences dialog box twice.